silvergrey chick with black head and large white circle around the eye. 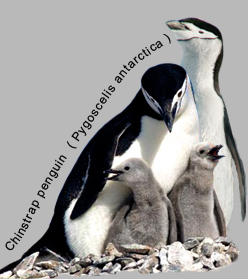 These four species all have a black band that runs like an inverted horseshoe over their fronts. And they have a pattern of black spots on their belly, which is unique for each bird, similar to our fingerprints. 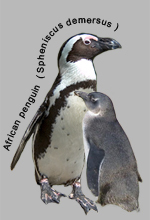 African (left) and magellanic (right) have both a broad white band from above the eyes, over the cheeks to the throat. 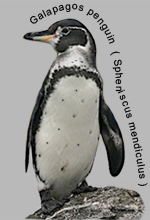 On the African penguin, this is connected with the second broad band that runs in an inverted horseshoe shape around their fronts, but on the magellannic they are two separated bands. 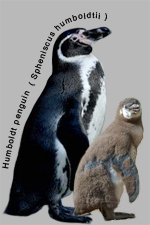 Humboldt (left) and galapagos penguin (right) have both a small white band from above the eyes, over the cheeks to the throat. 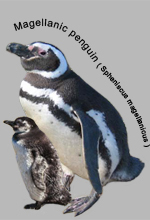 On the Humboldt penguin, these is connected with the second broad white band that runs in an inverted horseshoe shape around their front, but on the Galapagos it is separated by a small faint black band. 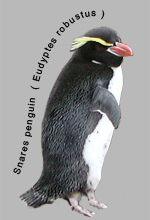 The Snares crested penguin (left) and the fiordland (right) differ from each other through the white stripes on the cheek of the Fiordland. 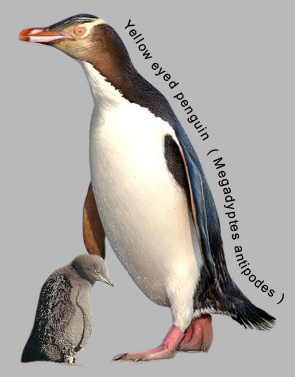 Furthermore the Snares penguin has a white-pink strip of bare skin around the bill. On both of them the crest starts at the base of the upper plate of the bill. The Snares crested (above) and the erect-crested (under) have both a white-pink strip of bare skin on the bottom edge of the bill, but the Snares crested has slightly darker feathers. 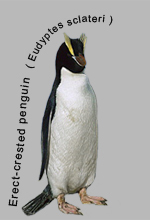 The erect-crested penguin is the only one who can stick his crest straight up in the air. Those upper four all have a crest which starts on both sides of the bill and goes backwards over the eyes. 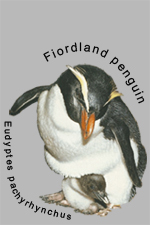 In case of the erect-crested the crest starts at the gape of the bill but in both Fiordland and Snares penguins the crest starts a bit higher at the base of the top plate of the bill. 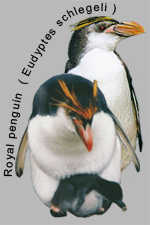 The crest of the rockhopper (right) is only a small stripe above the eyes and then blows out in a wide long yellow crest. On the head he has a little black tuft and he has bright red eyes. 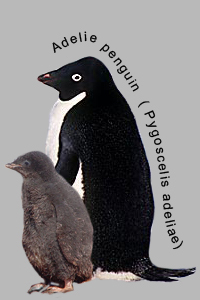 All other crested penguins have darker eyes. 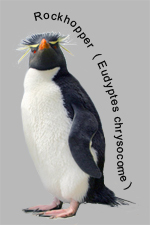 In case of the erect-crested the crest starts at the gape of the bill. 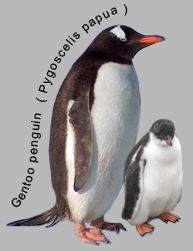 The next two penguins below differ from the above because their yellow-orange crest starts on the top of the bill between the eyes, and then split up and runs over the eyes backwards. 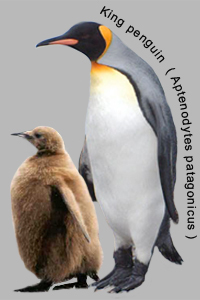 The royal penguin (left) has a white throat, while the macaroni (right) has a black one. 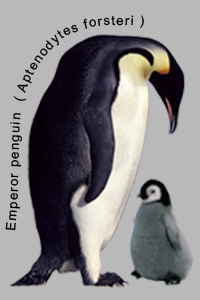 Furthermore the royal is a bit taller than the macaroni penguin. 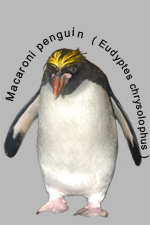 Some biologists consider the royal as a sub-species of the macaroni penguin. They have a broad yellow band running around the eyes and extending like a bonnet over the top of the head. They have yellow eyes, therefore their name. 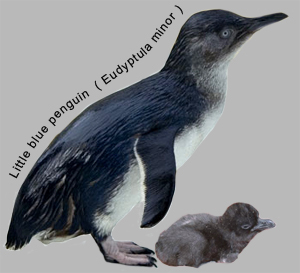 Juvenile chicks look a lot like the adults, but without the yellow band over the top of the head.